Under the light of the November supermoon sits a crowd of 350 Muslims, Christians and spiritualists looking out towards the Dead Sea. The interfaith crowd is gathered on the Jordanian side of the sea amid hundreds of floating lanterns to try and achieve something intangible and incredible: inner peace. “It was amazing how all these people gathered to do one thing: meditate,” says teacher Nesreen Khashman, who helped guide the full moon session. “We believe that if you want to change your life or change the world, the thing you have to start with is yourself. Mediation trainers Nesreen Khashman and Aseel Nassar lead the supermoon mediation beside the Dead Sea. Mediation may be a popular pastime in the West but here in the Middle East, it’s an age-old practice. “In our religion, Islam, God asks us to still our mind during each activity we do. If we pray, we have to think about every word or movement we make,” says Aseel Nassar, a meditation trainer with the Jordanian Thai Center for Meditation and Self-Development in Amman. The practice of meditation is becoming increasingly popular in Jordan, a country where 92 per cent of the population practices Islam and six per cent are Christian. "One of the techniques mediation teaches you is to still your mind so that you can be mindful in praying or fasting." Khashman explains that full moon meditation sessions run by the Thai centre usually attract around 150 people. But this month, the attendance rate more than doubled. The centre’s Facebook page – Mediation Jordan – currently sits at over 19,000 likes, with more than 3,000 likes garnered in the past year alone. And due to increasing demand, the centre will soon expand its outreach work to include groups like refugee children, in addition to women and youth. Meditator, Fares Akasheh and mediation trainers, Nesreen Khashman and Aseel Nassar (L to R). So why is meditation taking off in the Middle East? Nassar believes meditation can help the diverse people of Jordan cope with current social pressures. Jordan shares geographical borders with Syria, Iraq, Israel and Saudi Arabia. It officially became home to 24,000 new refugees from surrounding countries in 2015. UNHCR estimates that almost 56,700 Iraqi refugees live in Jordan (most are under 18), while Syrian refugees now make up around 7 per cent of the nation’s population. “We are living in a country that is located in between other Arab countries suffering from wars,” says Nassar. “So because of that we have some issues more than other countries, like stress. "What we are all searching for, regardless of our background, religious view or colour, is a better place where everyone can live in harmony." 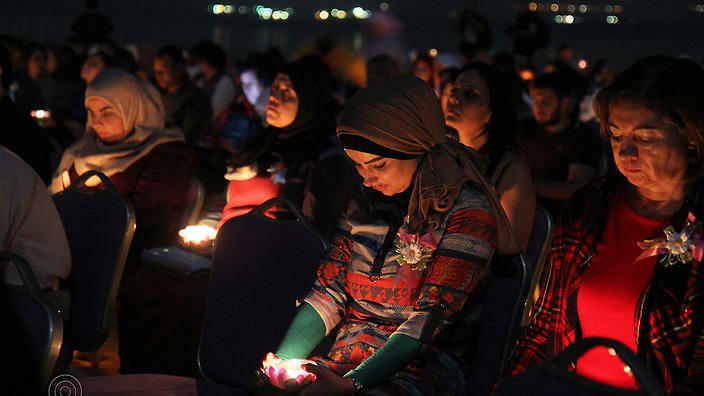 Meditators light floating Thai lanterns as an act of peace. “Meditation helps you to release the stress you find in yourself. I consider mediation as an exercise for the mind. Meditation helps you to get a calm mind and release all the [useless] thoughts and get a peaceful mind. Khashman agrees. She is passionate about the transformative power of meditation and is hopeful that everyone in Jordan can achieve inner peace and enlightenment by adopting the practice. “We are creating a mediation movement now, with Muslims, Christians and Buddhists together,” Khashman says. “[Because] what we are all searching for, regardless of our background, religious view or colour, is a better place where everyone can live in harmony.